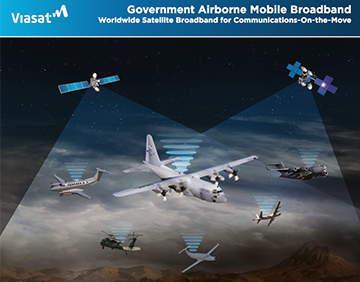 Viasat Incorporated's (NASDAQ: VSAT) Ku-/Ka-band multi-network, multi-mode Global Mobile Antenna (GMA) 5560-101 has successfully completed the Federal Aviation Administration (FAA) D0-160G certification process and the U.S. Air Force Materiel Command (AFMC) C-17 Modified Airworthiness Certification Criteria (MACC) testing. By completing the certification and test programs, the Viasat antenna has demonstrated it can provide powerful in-flight broadband connectivity, enabling advanced situational awareness, en-route mission planning as well as a host of other applications that demand the highest forward and return link capacity available. The DO-160G certification enables Viasat’s antenna to be immediately installed on select United States Air Force (USAF) and Foreign Military Sale (FMS) senior leader, VIP and other military aircraft. Passing all AFMC C-17 MACC tests demonstrates the antenna’s ability to become fully-certified for USAF and FMS C-17 platforms. Viasat is in the process of submitting C-17 MACC test reports for official review. Ken Peterman, President, Government Systems, Viasat, said that the GMA 5560-101 is the first SATCOM antenna to successfully complete D0-160G certification and also pass the full suite of rigorous C-17 MACC testing, with zero gap analysis. The GMA 5560-101 provides the copmany's senior leaders and military forces with the flexibility and resiliency to communicate and operate globally on multiple government and private sector networks both now and well into the future. Learn more about what is occurring in the industry — network with leaders that can help guide business success through the application of new technologies — note the advanced trends that will enhance business opportunities. Register today for Satellite Innovation 2018, occurring in October in Silicon Valley.